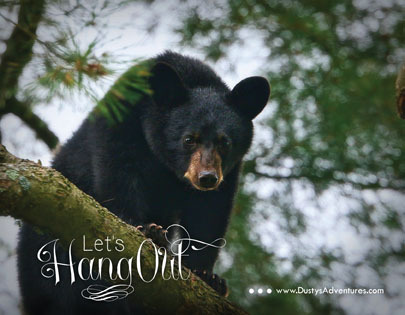 Energize Your Fundraising Project with Adventure! 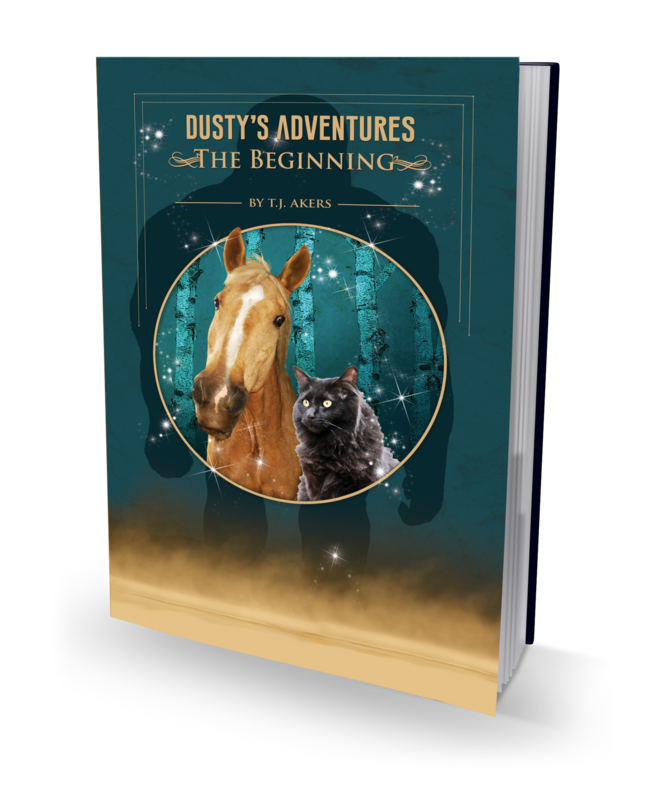 Dusty’s Adventures “The Beginning” is a first edition children’s fantasy novel. 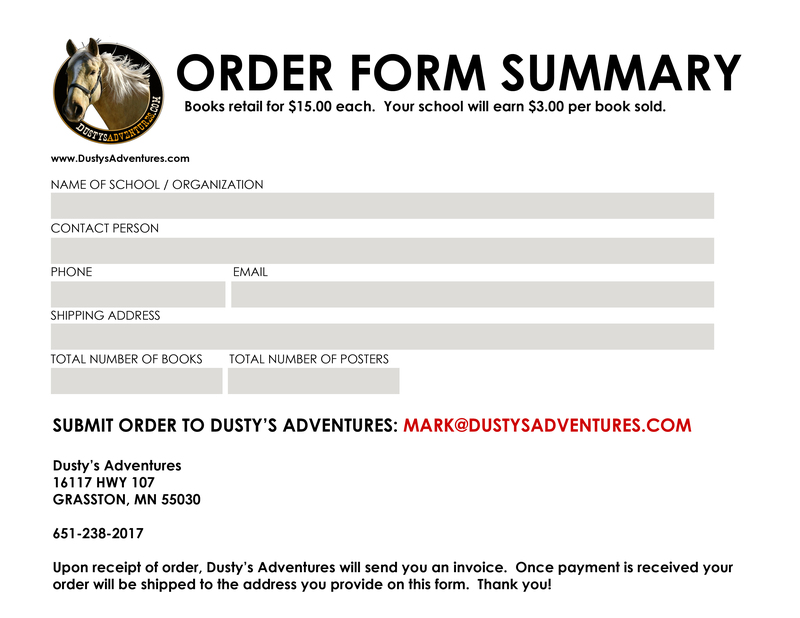 Dusty’s Adventures promote good reading habits while boosting your fundraising project. 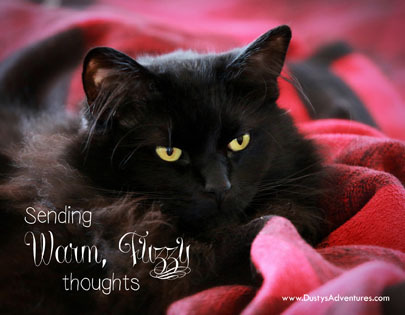 Dusty is a real life superhero along with his sister Daisy and barnyard sidekick, Kitten. 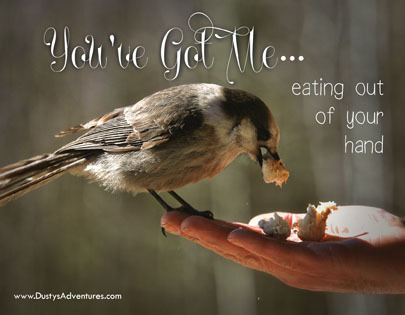 In this day of digital media and impersonal communication, wouldn’t it be nice to give and receive something a little more personal? In an effort to do this we present this inspirational journey of adventure and friendship. 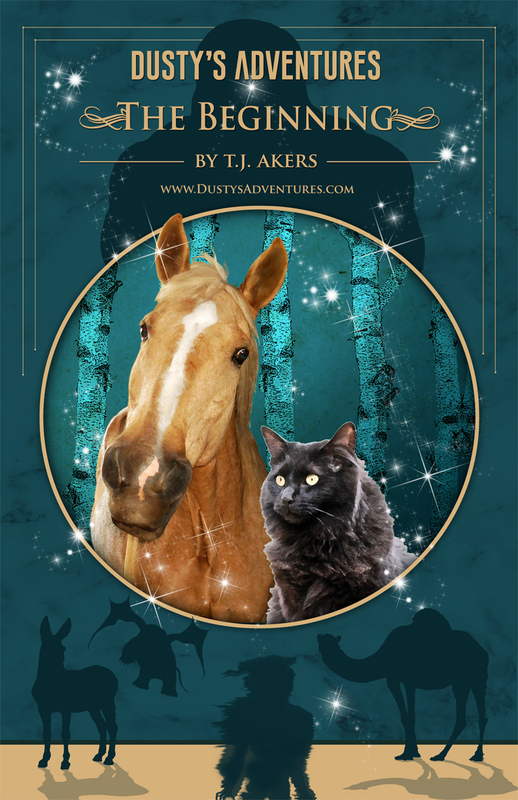 Dusty’s Adventures brings the thrill of reading to life! Earn $3 for any fundraising products sold. Promote reading while raising money for your school or organization. 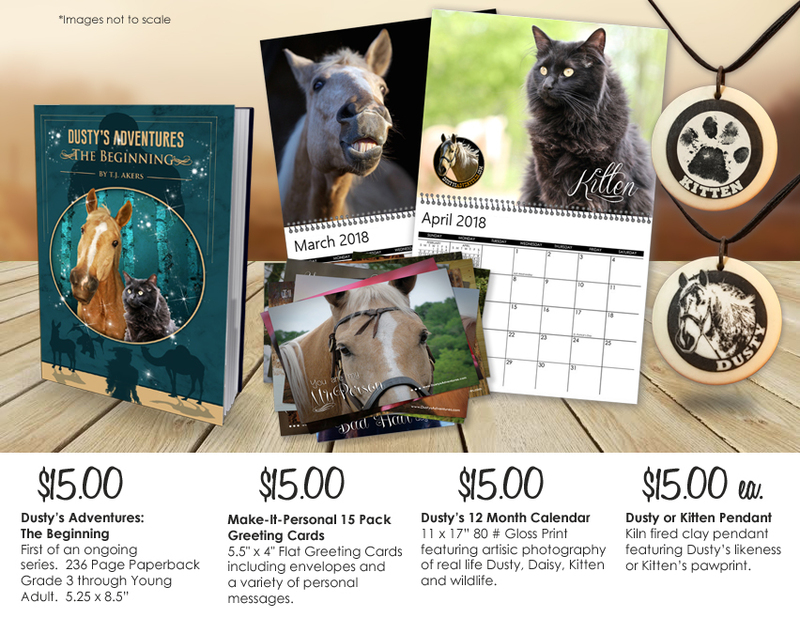 Contact us today about obtaining a Dusty’s Adventures Fundraising Kit. 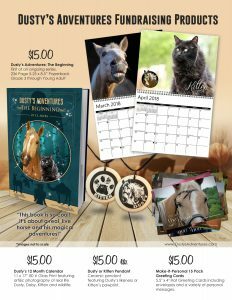 Your fundraiser consists of three quality items with the adventurous animal lover in mind; the first edition of Dusty’s Adventures, “The Beginning”, pendants highlighting our two stars: Dusty and Kitten and calendars depicting Dusty, Daisy, Kitten and wildlife from their nation wide travels. 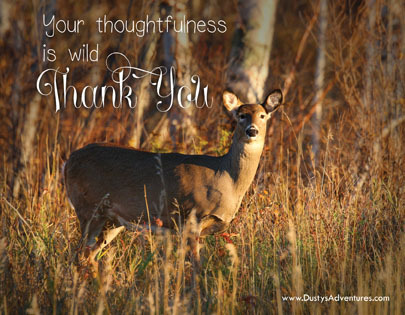 The Make-It-Personal greeting cards send meaningful thoughts of endearment, the old-fashioned way. 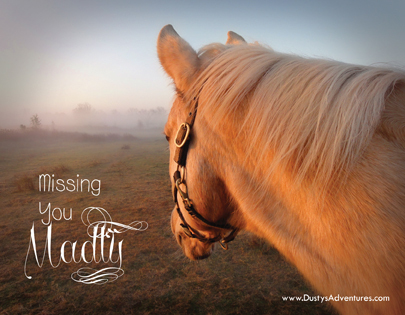 All photos are taken during Mark and Dusty’s quests and adventures of the horses, Kitten and wildlife. It’s fun choosing the right card for the moment! Total: $5400.00 raised for your school! Fundraising that promotes goodwill and reading! The first of a series of brilliant adventures featuring real life characters, magical creatures and tales inspired by true happenings and unlimited imagination. 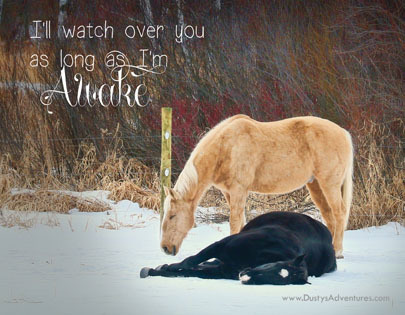 Become friends with Dusty, a real live horse turned hero out of necessity, and his indomitable sidekick, a rescued youngster named Kitten. 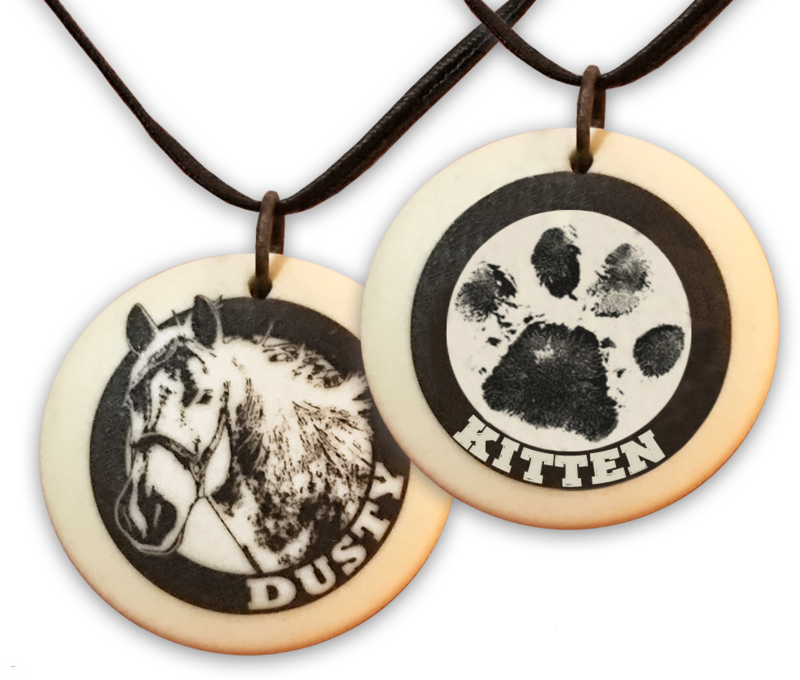 Kitten owes his life to Dusty for real, but that’s in the story. The Adventure Tour. 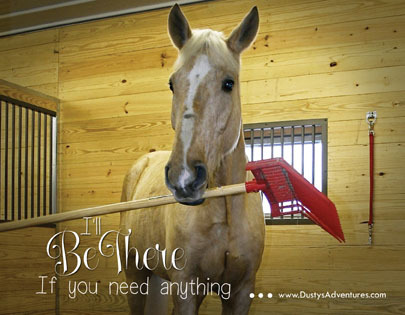 Dusty has traveled nationwide visiting children in need and Ronald McDonald houses. 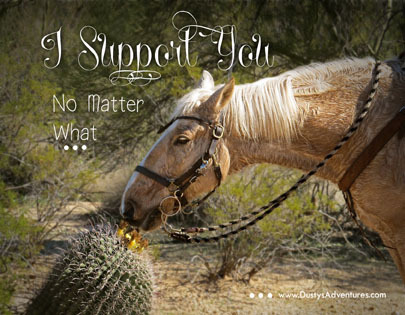 The book project and fundraising helps keep Dusty on the road across the nation bringing goodwill and cheer. Schools and clubs who sell 8,000 books earn a FREE visit from the real live Dusty and his sister, Daisy May. 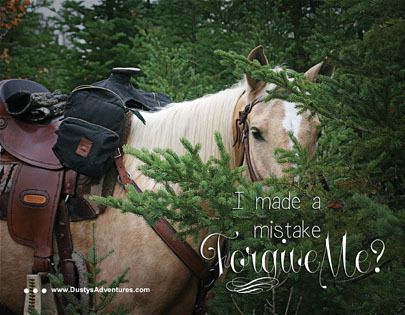 Schools and clubs who sell 5,000 books will receive a free Dusty’s Adventures poster for each selling participant. 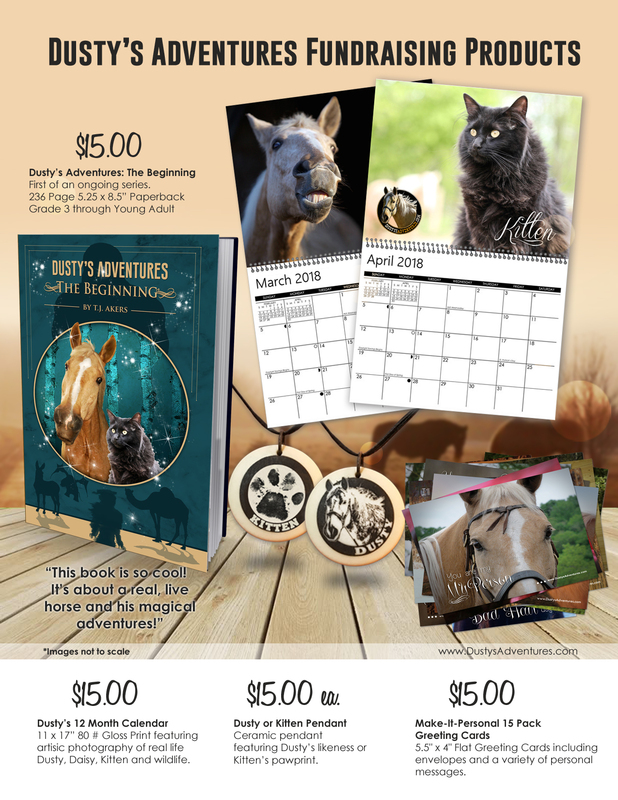 If you are not ready for the full fundraising package from Dusty’s Adventures, you may still purchase the books for your students and earn three dollars per book profit for your school. 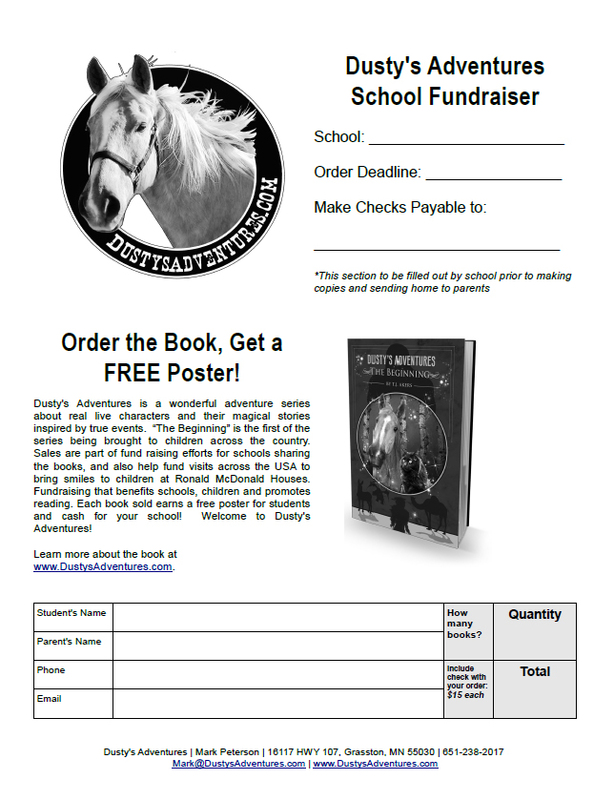 Take orders directly from your students, fundraising made simple! 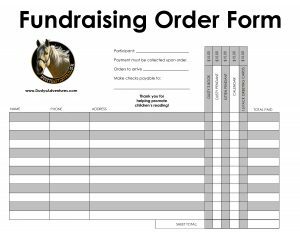 To get started, simply download, print and make copies of the Parent Order Form to be sent home with your students, then download and print the Order Form Summary to total your sales. Upon completion of your campaign, fill out the Order Form Summary and return it to us so that we may process your order and ship your books and FREE posters (one per sale). Earn $3 per book sale. Easy! 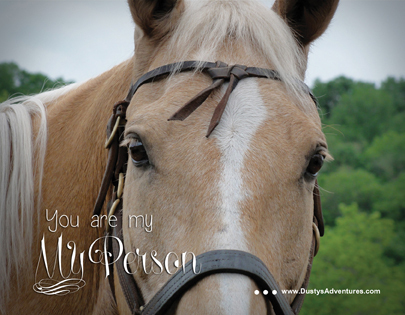 Dusty’s Adventures provides helpful sales tools; full color product sheet and easy to write on sales form. 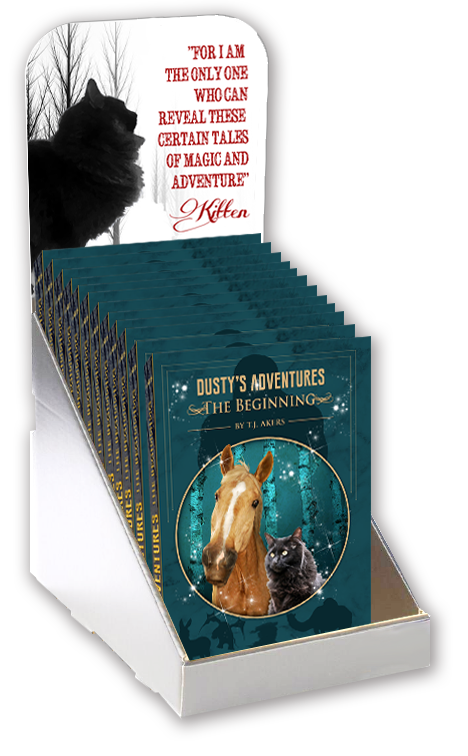 Dusty’s Adventures will provide a POP Display to stores and restaurants. Set up a display in your storefront which can earn you income and help support children’s charities while promoting youth reading! POP Displays will only feature Dusty’s books, one product for ease of sales and limited space. Raise funds and promote reading!